This book, based on extensive field research, examines the Indian state's response to the multiple insurgencies that have occurred since independence in 1947. In reacting to these various insurgencies, the Indian state has employed a combined approach of force, dialogue, accommodation of ethnic and minority aspirations and, overtime, the state has established a tradition of negotiation with armed ethnic groups in order to bolster its legitimacy based on an accommodative posture. While these efforts have succeeded in resolving the Mizo insurgency, it has only incited levels of violence with regard to others. 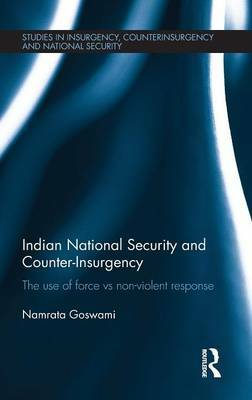 Within this backdrop of ongoing Indian counter-insurgency, this study provides a set of conditions responsible for the groundswell of insurgencies in India, and some recommendations to better formulate India's national security policy with regard to its counter-insurgency responses. The study focuses on the national institutions responsible for formulating India's national security policy dealing with counter-insurgency - such as the Prime Minister's Office, the Cabinet Committee on Security, the National Security Council, the Ministry of Home Affairs and the Indian military apparatus. Furthermore, it studies how national interests and values influence the formulation of this policy; and the overall success and/or failure of the policy to deal with armed insurgent movements. Notably, the study traces the ideational influence of Kautilya and Gandhi in India's overall response to insurgencies. Multiple cases of armed ethnic insurgencies in Assam, Manipur, Mizoram, and Nagaland in the Northeast of India and the ideologically oriented Maoist or Naxalite insurgency affecting the heartland of India are analysed in-depth to evaluate the Indian counter-insurgency experience. This book will be of much interest to students of counter-insurgency, Asian politics, ethnic conflict, and security studies in general.